Wow. 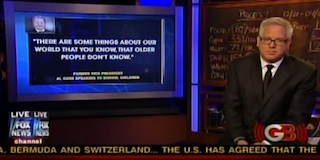 Well, here’s a new theory as to why Glenn Beck is leaving Fox News. Here we thought Beck’s move further towards Internet news with The Blaze was just a canny admission of where the industry is heading. However, today, Beck made comments that seemed to imply that he just doesn’t think he can reach a young audience on his current network. The comments came as Beck was reviewing clips of Van Jones speaking to students. Jones made a joke about the young people in the audience confronting “Uncle Joe” at Thanksgiving, the family member who “loves Fox News.” Beck stopped the tape there. I’m sure there are a number of reasons that Beck is leaving Fox News, however, I wouldn’t doubt for a second that this is one reason why he views the leave as a good thing. After all, Beck, for all his mocking of “the students” and their Facebooks and Googles, has made it very clear over the years that he sees teaching young people as a number one priority. Just think back to all the clips he showed last summer of children at his Rally, pleading to parents they needed to let their kids know how to be proud of America. And, it’s no obscure joke that Fox News’ audience skews older. Beck talks a lot about his talent for understanding the enemy and knowing how they think. If he believes that the likes of Van Jones and Al Gore are trying to “brainwash” our kids, of course he’d want to find a platform where he can beat them to it. On the upside, no more “Hooray for Old People!” episodes.